This is the second paper that examines in more detail the issues briefly examined in the video. In the last entry we examined the failure of the US media to communicate about the nature of the strong scientific consensus about human-induced climate change. In this post we look at the failure of the US press to communicate about the enormous magnitude of greenhouse gas emissions reductions necessary to prevent harsh climate change impacts. The consistent barrier that the United States has been in developing a global solution on climate change for over 20 years. Most Americans are completely unaware of the magnitude of global greenhouse gas emissions reductions necessary to prevent dangerous climate change. If US citizens don’t understand the size and scope of the problem, they will almost certainly refuse to support legislation and policies necessary to put the United States on an emissions reduction pathway that represents the US fair share of safe global emissions. Because, as we discussed in the last entry, the scientific consensus is so strong that the world is headed to harsh and dangerous impacts, the US media’s failure to communicate clearly about the magnitude of the problem facing the world is a serious, grave, and tragic lapse. No US national climate change strategy makes any sense unless it is understood to implicitly be a position on the US fair share of a global greenhouse gas emissions reductions pathway capable of preventing dangerous climate change. Yet when US federal climate change legislation was under consideration between 2009 and 2010, there was almost no public discussion about whether proposed US climate change legislation would reduce US greenhouse gas emissions to levels that represent the US fair share of safe global emissions. 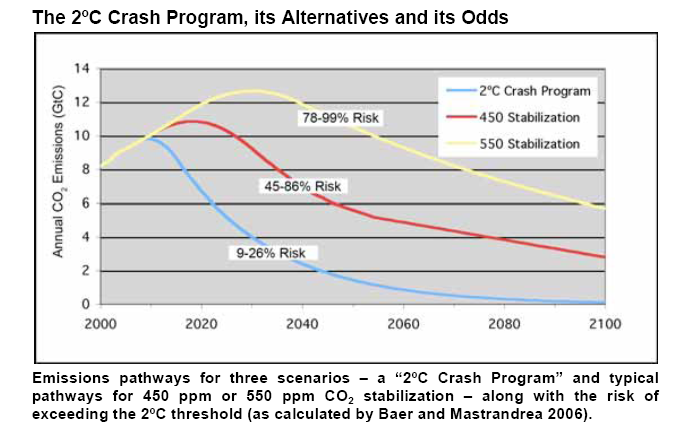 To understand the urgency for civilization challenging emissions reductions it is necessary to understand: (a) what temperature increases will likely trigger harsh climate change impacts, (b) what atmospheric concentrations of greenhouse gases will cause specific temperature increases that are of concern, and (c) what quantities of greenhouse gas emissions will exceed atmospheric greenhouse target concentrations. Only then can one understand the amount of global greenhouse gas emissions reductions from business as usual that are necessary to avoid dangerous climate change. The international community agreed at a meeting of the conference of the parties under the United Nations Framework Convention on Climate Change in Copenhagen in 2009 that the world must work together to limit warming to an additional 2oC to avoid rapid non-linear impacts from climate change. The 2oC warming limit was agreed to because there is widespread agreement among the vast majority of mainstream scientists that warming of more than 2oC significantly increases the probability of harsh climate impacts. However, catastrophic harms, at least for some parts of the world, could be triggered by additional warming of less than 2oC because there is uncertainty about how the Earth will respond to different increases in temperatures. (Athanasiou and Bear 2002) The 2oC upper temperature limit is quite controversial scientifically because, as we shall see, some scientists believe that lower amounts of additional warming could set into motion rapid climate changes that could greatly harm people around the world and increases of as little as 1oC will likely greatly harm some people in some regions. There is substantial scientific evidence that even a 1.5°C temperature limit would not be sufficient to protect those most vulnerable to climate change. For instance, a recent paper by Jim Hansen and seven other authors concluded that additional warming should be limited to 1°C warming to prevent serious harms. (Hansen et al 2008) To do this, existing atmospheric concentrations of CO2 must not only not be allowed to rise the small amount to 450 ppm CO2 from current levels of 394 ppm CO2 but must be reduced below existing levels to 350 ppm CO2. (Hansen et al. 2008) According to this paper, the world has likely already shot past the level of atmospheric greenhouse gas concentrations that will lead to dangerous climate change for many. According to Hansen and his collaborators, the world has already used up all of the assimilative capacity of the atmosphere and biosphere that has been available to buffer against dangerous climate change. As a result, this paper asserts that to prevent dangerous climate change the world must not only reduce its emissions but reduce existing greenhouse gas CO2 atmospheric concentrations from the current 394 ppm to 350 ppm CO2 to avoid dangerous climate change. We feel compelled to note that even a “moderate” warming of 2°C stands a strong chance of provoking drought and storm responses that could challenge civilized society, leading potentially to the conflict and suffering that go with failed states and mass migrations. Global warming of 2°C would leave the Earth warmer than it has been in millions of years, a disruption of climate conditions that have been stable for longer than the history of human agriculture. Given the drought that already afflicts Australia, the crumbling of the sea ice in the Arctic, and the increasing storm damage after only 0.8 °C of warming so far, calling 2°C a danger limit seems to us pretty cavalier. In thinking about an upper temperature limit, many scientists are concerned with avoiding runaway climate change. That is, they fear that global temperatures will exceed a tipping point that will trigger a release of stored carbon from the biosphere, an event that would cause further rapid climate change. Runaway climate change would mean that governments would lose the ability to control future climate change that they would otherwise have through reducing greenhouse gas emissions from fossil fuel combustion and deforestation. That is, runaway climate change means that human action would be unable to stop significant temperature increase without massive geo-engineering. (Washington and Cook 2011: 30-31) This is so because, among other things, there are vast amounts of methane stored in permafrost, methane hydrates on the ocean floor, and carbon in the forests that could be released as the world warms. If the world warms too much, increased temperatures could cause huge amounts of carbon to be released that would overwhelm the quantities of carbon being released through fossil fuel combustion and deforestation. This is known to be a possibility, because such releases of stored carbon have happened in Earth’s history and caused rapid non-linear Earth temperature changes. And so, the magnitude of greenhouse gas reductions needed to prevent dangerous climate change is understood to be the reductions from business-as-usual that will allow atmospheric concentrations of greenhouse gases to be stabilized at levels that will limit warming to between 1 to 2°C with prudence calling for a 1°C limit. We now turn to what atmospheric greenhouse gas atmospheric concentrations levels are understood to prevent warming above these amounts. The amount of warming that will be experienced from different greenhouse gas atmospheric concentrations is usually referred to as the issue of “climate sensitivity.” Climate sensitivity is somewhat uncertain as there are remaining scientific uncertainties about the magnitude of the positive and negative feedbacks in the climate system. To operationalize an upper temperature limit, the international community must set an atmospheric greenhouse gas concentration stabilization limit. Since there is scientific uncertainty about how much warming will be experienced by different atmospheric greenhouse gas concentration levels, there is significant scientific controversy about what the greenhouse gas atmospheric stabilization target should be to achieve any warming limit. Making the calculation of emissions reductions needed at any one time is complicated by the fact that how rapidly greenhouse gas emissions must be reduced is a problem that depends upon when global emissions reductions begin. The longer the international community waits to reduce greenhouse gas emissions, the steeper the necessary emissions reductions pathway becomes. It is relatively easy to calculate the amount of additional tons of emissions that can be allowed to stabilize atmospheric concentrations at a certain level such as 450 ppm CO2 but this number will depend upon when emissions reductions begin. At any time it is therefore possible to create a budget that identifies the total tons of emissions that can be allowed before a specific atmosphere concentration is exceeded but the longer the international community waits to begin to reduce emissions, the steeper the reductions must be. The magnitude of the challenge entailed by the need to set a greenhouse gas atmospheric concentration target becomes evident after looking at the probability of exceeding 2°C if CO2 equivalent targets are set at specific levels such as 450 or 550 ppm. In the following chart the colored lines represent emissions reduction pathways that would stabilize atmospheric concentrations of carbon dioxide equivalents at various levels. The yellow line is a pathway that would stabilize at 550 ppm. The red line is a reduction pathway that could stabilize carbon dioxide equivalent at 450 ppm. The numbers on the boxes on these two lines specify the probability of exceeding 2°C if atmospheric concentration levels are stabilized at these levels. From this chart we therefore see that if atmospheric carbon dioxide is stabilized at 550 ppm there is between a 75% and 99% chance that the world will experience temperatures in excess of 2°C. Looking at the red line we see that even at a stabilization level of 450 ppm there is between a 45% and 86% chance that the world experience increases in temperature greater than 2°C. Because CO2 levels are already approaching 395 ppm and other greenhouse gases make current carbon dioxide equivalent levels in the vicinity of 430 ppm it becomes evident that the world is running out of time to stabilize atmospheric carbon dioxide levels in the atmospheric concentrations that would limit warming to 2°C. Because as we have seen it is possible that temperature increases as small as 1°C will create harsh impacts for some people in some parts of the world it becomes apparent that the need to reduce greenhouse gases aggressively, and dramatically, and urgently. As you can see, if we delay the global emissions peak until 2025, we pretty much have to drop off a cliff afterwards to avoid 2 degrees C. Short of a meteor strike that shuts down industrial civilization, that’s unlikely. This, then, is the brutal logic of climate change: With immediate, concerted action at global scale, we have a slim chance to halt climate change at the extremely dangerous level of 2°C. If we delay even a decade — waiting for better technology or a more amenable political situation or whatever — we will have no chance. Although the challenge of achieving sufficient global greenhouse gas emissions to prevent 2°C is extraordinarily daunting, as we have explained above a 2°C warming limit may not prevent catastrophic harm because temperature increases more than 1°C may cause great harm. International climate negotiations have sought to find a global solution to climate change since they began in 1990 and have struggled since then to reach a global deal among most countries to prevent dangerous climate change. Because global emissions continue to rise rather than decrease after 20 years since climate change negotiations began, the international community has lost several decades in finding a way to prevent dangerous climate change. And so, the human race may be running out of time to prevent dangerous climate change. Yet most Americans are unaware of the seriousness and urgency of the staggering problem we are facing. The US media has utterly failed to sound the alarm about the magnitude of the threat of climate change. Athanasiou, T. and Bear, P. (2002), Dead Heat: Global Justice and Global Warming, Westminster, MD: Seven Stories Press, Canada. CO2Now (2012) Earth’s CO2 Now Home Page http://co2now.org/ (March 2012).